This happy pup is absolutely over the moon with his new toy. Seeing this, we can’t help but think that all animals deserve the chance to experience the little joys in life. 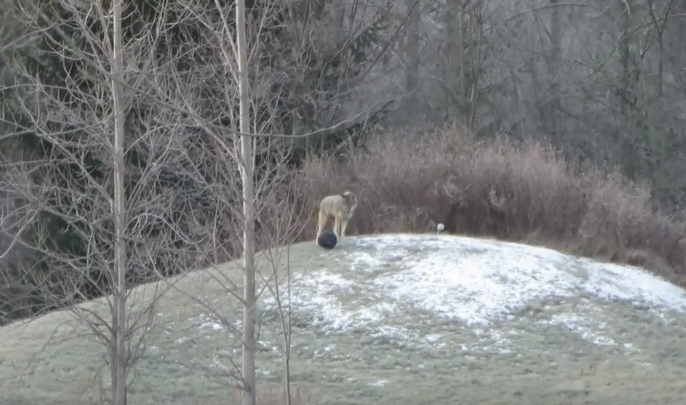 It's pretty rare to see a coyote this close to the house at all, and totally unexpected to see one playing with the dog's ball in broad daylight! There is no questioning that coyotes can be dangerous; they are predators after all, but if we keep our distance and give them the ample habitat they need to thrive then we can all live in harmony. The coyote is a prominent character in Native American legends (Southwestern United States and Mexico), usually depicted as a trickster who alternately assumes the form of an actual coyote or a man. As with other trickster figures, the coyote acts as a picaresque hero which rebels against social convention through deception and humor. Responses to "Wild Coyote Finds a Ball and Does Something Hilarious"
This is really cute to see. All animals like to play and coyotes are no different. Thanks for sharing. Cute and beautiful. They are just people like us in an animal body. I guess, they are even more human than we are. And yet these poor creatures are cruelly trapped, have their heads stomped on to kill them just so humans can have a bit of fur around their winter coats..... DONT WEAR CANADA GOOSE COATS! To Lell: I don't believe they are killed for their fur. I have proof that they are killed because they have been viewed as vermin from day one. A seen coyote is a dead coyote. You cannot get it into people's heads that if you let one family on your land, they will fight to the end to keep other coyotes off it. Like talking to a rock. Everyone loves to play. Wild or domesticated. I am glad is having great fun!